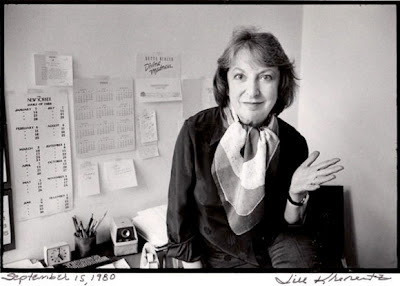 Christina Newland: Writing on film & Culture: Pauline Kael, I talk about you too much. Pauline Kael, I talk about you too much. A good amount of the time, I angrily disagree with whatever Pauline Kael had to say about movies. As a long-residing queen of movie criticism at the New Yorker from 1968 to 1991, she courted no small amount of controversy with her opinions. Yet it always seems to me that no matter how violently I disagree with her, and no matter how much I scratch my head and wonder how such a brilliant woman could have so obviously missed the mark, she is one of my very favourite film critics. She was responsible for a crop of followers nicknamed the 'Paulettes', who reviewed and wrote movies in a style inspired by her. Paul Schrader (most famously the director of American Gigolo and writer of Taxi Driver) started out as a film critic and Kael hanger-on, and cites her as hugely influential. I've become something of an accidental 'Paulette' myself, as I seem to be constantly pointing out her opinions to anyone who'll listen. Pauline tended to either love a movie or hate it - it was rare she felt indifferent about anything. She passionately insisted that movies should not be intellectualised out of reach or elevated to too highbrow a status, as they were made to be enjoyed by the masses. She crushed art-house directors like Antonioni and Resnais under her critical boot-heels for their so-called pretension. At the same time, she is one of the critics who helped to elevate movies to a more highbrow position. She refused to watch a movie more than once, frequently contradicted herself, and was strangely harsh on anything she felt had too much of a 'message'. On top of this, she frequently broke the golden rule of unbiased movie criticism: don't fraternize with the directors...or writers...or stars. (Warren Beatty, I'm looking at you.) So, having said all this, why is she worth talking about? Pauline was all about the physicality of actors, their energy and the way they used their bodies and faces. She was concerned with the visceral enjoyment factor of the films she watched, her pure delight in them as movie magic; as entertainment. She celebrated the thrill of Jaws and the campy pleasure of The Warriors. No one I've read so far seems to write about movies with the same sort of barbed wit and passion. Yet, when I read her dismissal of Network or her disdain for Raging Bull, I feel completely baffled, mildly outraged. What could she have been thinking? But somehow, whenever I watch a movie, I keep going back to her reviews. Sometimes she even points to flaws in films that once I notice, I can't seem to un-see, reminding me that my own critical faculties clearly need more development. What I'm about to say I'll repeat in hushed, reverent tones, careful to point out that it is one of my favourite films. But in all honesty, now that she's mentioned it... maybe Network is a little bit preachy.